Definition - What does Parivrtta Anjaneyasana mean? In this pose, the yogi begins in a low lunge position with the hands in prayer position at the heart center. The torso then twists toward the lead leg, placing the opposite upper arm on the thigh while holding prayer position. The chest twists toward the sky and the gaze is upward over the shoulder. Parivrtta anjaneyasana may also be referred to in English as revolved crescent lunge. Traditionally, parivrtta anjaneyasana is believed to activate the third, or manipura, chakra. This chakra is the body's energy and vitality center, providing confidence, internal strength and courage. Activating the manipura chakra through parivrtta anjaneyasana is thought to dispel fear and insecurity. There are several modifications and variations of the asana. 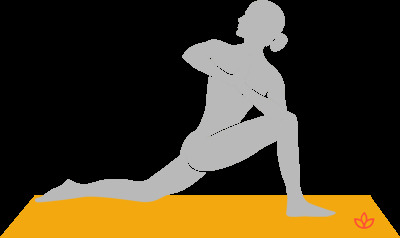 For a more challenging version, lift the back knee off the ground in a standard lunge position. Sometimes considered a variation of this asana, parivrtta parsvakonasana uses a different arm position. In parivrtta parsvakonasana, the opposite arm rests on the lead leg or reaches to the ground, while the other arm extends overhead, creating a twist through the core of the body. Finally, yogis with neck pain can keep the gaze forward or down to avoid twisting the neck.